On Thursday, that same 4,300-horsepower machine will carry Bush's casket, along with relatives and close friends, for around 70 miles. The journey through five small Texas towns was expected to take about two and a half hours. It will deliver the casket from suburban Houston to College Station. 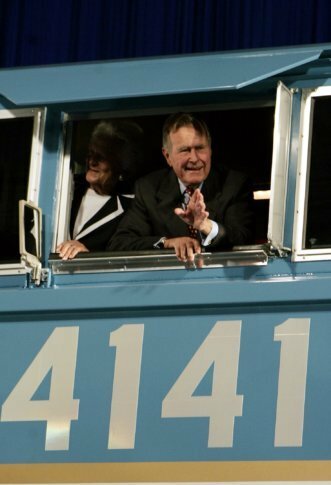 “I might have left Air Force One behind,” Bush quipped during the 2005 unveiling of 4141, a blue and gray locomotive commissioned in honor of the 41st president and unveiled at Texas A&M University. On Thursday, that same 4,300-horsepower machine left a suburban Houston railyard loaded with Bush’s casket for his final journey after almost a week of ceremonies in Washington and Texas. The train then embarked on a slow roll to his presidential library in College Station, passing thousands of people who stood along the tracks. Many of them held up their phones for pictures and watched from highway overpasses. “Hopefully, my children will remember the significance and the meaning of today,” said Gordon, 38. In Addison’s hand were two small American flags. More than two hours after departing, the train rolled to a stop in College Station, where Bush was laid to rest during a private ceremony next to his wife, Barbara, who died in April, and his daughter Robin, who died at age 3 in 1953. Family members, including former President George W. Bush, were also aboard the 12-car train that was greeted by student cadets and mourners upon arriving at Texas A&M University. The train’s sixth car, a converted baggage hauler called “Council Bluffs,” was fitted with transparent sides to allow the mourners lining the tracks views of Bush’s flag-draped coffin. The train rolled past the flashing lights of firetrucks, some hoisting American flags from their ladders, and past state troopers who saluted from the side of the tracks. It is the eighth presidential funeral train in U.S. history and the first since Dwight D. Eisenhower’s body traveled from the National Cathedral in Washington through seven states to his Kansas hometown of Abilene 49 years ago. Abraham Lincoln’s funeral train was the first, in 1865. Union Pacific originally commissioned the Bush locomotive for the opening of an exhibit at his library titled “Trains: Tracks of the Iron Horse.” It was one of the few times the company has painted a locomotive any color other than its traditional yellow. After a brief training session during 4141’s unveiling 13 years ago, Bush took the engineer’s seat and helped take the locomotive for a 2-mile excursion. Union Pacific was contacted by federal officials in early 2009 and asked, at Bush’s request, about providing a funeral train at some point, company spokesman Tom Lange said. “We said, ‘Of course and also we have this locomotive that we would want to have obviously be part of it,'” Lange said. He noted that trains were the mode of transportation that first carried Bush to his service as a naval aviator in World War II and back home again. See AP’s complete coverage of George H.W. Bush here: https://www.apnews.com/GeorgeHWBush .